Today was a cold windy trip with air temps around 45 and wind speed around 25 MPH. To our surprise the fish were biting! We ended up boating over 30 bass and Willy caught his new personal best! Some fish are still trying to spawn, but with cooler weather moving in look for those fish in pre-spawn areas. Target areas with clean water using senkos, spinnerbaits and jerkbaits. White, chartreuse, black and blue have been the most productive colors. 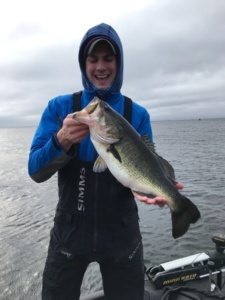 The fish are grouped together this time of year so cover water until you find a quality bite or two, then slow down and take your time picking these areas apart.